Magic tricks, a game in which time is confounded. A gimmick piled atop another. 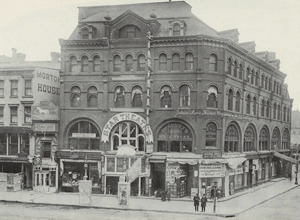 “Star Theatre” is the first popular example of American camera play. Frenchman Georges Melies had pioneered the use of stop-trick and time-lapse effects in his special-effects films, beginning in 1896. Armitage, an employee of the American Mutoscope and Biograph Company, took advantage of the company’s office position at Broadway and 13th in New York to document the demolition of the title building. He came up with the idea of bolting the camera down and exposing a bit of film every four minutes during daylight hours while the work progressed. When finished, the film shows the structure coming apart and disappearing with magical rapidity. Meanwhile, a nearby awning snaps up and down like a clockwork toy; pedestrians skitter like thrown jacks along the sidewalks, while traffic shoots past the camera at jet speed. Short establishing shots at the beginning and end of the sequence revert to normal-time, giving the viewer a satisfying sense of completion. Although the original sequence simply tracks the demolition, another level of novelty, and an explanation for the film’s extended titles, is introduced by the company’s recommendation to exhibitors that the film be run backward through the projector. “When this view is shown in reverse, the effect is very extraordinary,” the directions state. Louis Lumiere had first come up with the idea of running film backward for novelty effect almost immediately, in 1895. Lave it to the imaginations of the filmmakers to double the potential fun here. And why demolish it first, then build it back up? Why not the other way round? The plastic possibilities of the medium were to be rapidly engaged, exploited and expanded upon.